One of Japanâ€™s most critically acclaimed games arrives stateside, as Majesco announced today Phantom Dust has shipped to retail stores nationwide. Available exclusively for the Xbox video game system from Microsoft, for a suggested retail price of $19.99, Phantom Dust features Xbox Live support, enabling players to compete, trade skills, and share statistics online. In Phantom Dust, gamers assume the role of the â€œgifted oneâ€� trying to unlock the events of the recent apocalypse, causing the near-destruction of the human race. Players emerge from underground to find that the surface is covered with mysterious particles called Phantom Dust, and is inhabited by creatures which embody peopleâ€™s worst nightmares. Players utilize supernatural skills to defeat opponents, and regain lost memories. 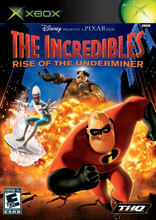 An action-adventure game designed to continue the story of the 2004 feature film, the comprehensively credentialed Disney Presents a Pixar Film: The Incredibles -- Rise of the Underminer allows player..